Pollen Is Over. Now Let’s Get to Work. You did it! You survived another season of North Carolina pollen. If you’re like most people in Raleigh, your home, driveway, car, deck, and everything else are covered in the stuff. If you, or your allergies, are itching to get rid of your property’s layer of pollen, our team is ready. 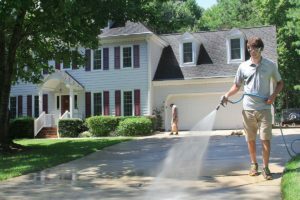 This is the time of year to wash away the remnants of winter and spring and get your home ready for summer, and Fairway Home Detailing has a thorough protocol for getting your property’s exterior back in shape. See what our members benefit from most this time of year below. Decks: Pressure washing for your deck not only removes that layer of pollen, it removes a variety of coatings that make your deck look older and duller than it is. We’ll first wash it thoroughly, then apply a preservation application to keep it looking clean and new for longer. Concrete & Pavers: Your driveway, sidewalks, stone pathways, and the like aren’t immune during spring either, so we’ll clean those as well. We also take the time to brighten these surfaces and repair cracks, so they don’t bring down the appearance of your home. Roofing: Your roof could likely use a good washing this time of year, especially if your house is surrounded by tall trees. Our team will safely do the job for you and bring your roof back to life. Storm Windows: These can be difficult to clean on your own. 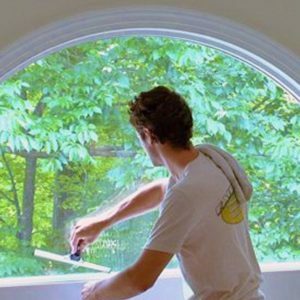 Our professionals will remove, clean, and reinstall storm windows for you. Historic Home Windows: Historic homes often feature original windows, and we understand how important these are to homeowners. We also know how fragile they can be. We have the training and experience to carefully clean delicate, ornate windows, giving you great results and service you can trust. Between these two services, your home will look fresh and ready for summer, and you’ll be officially rid of pollen for another year! These are just a couple of the services we provide for our valued members. Click to learn more about our other offerings, and find out what’s involved in our membership plan. Give us a call today to discuss what we can do for your home! Want VIP Monthly Home Maintenance Service? Act Fast!